Landscaping yards are where you are going to purchase the materials needed to build your landscaping projects. This is the first section of our estimating landscaping supplies series, and it begins with a visit to a local Calgary landscaping supplies yard. 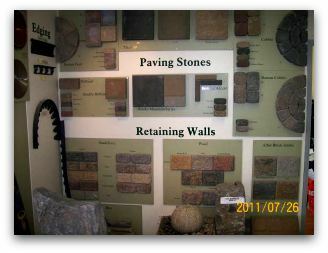 A special thanks goes out to Ornamental Stone in Calgary, Alberta, Canada for allowing us to put this helpful information together. Looking for a good supplier is important, so here is how to choose the right one. As a landscaper, this is the criteria I use for choosing stone yards or a good landscape supplier. They have to have a wide range of products at the most competitive price. No one can possibly carry everything, but if you ask for it, they will get it for you when they can. They have to have a knowledgeable staff and good customer service. Location is also be important. It has to be convenient at any time of the day. Fuel prices are high and time is money. Landscaping in Calgary led me to Ornamental Stone. Hopefully, you can find this in your area. The friendly, accommodating, knowledgeable staff is important, but they also had a great selection of products and materials we were able to photograph for this article. Now you get to do some window shopping right here in the comfort of your home. At Ornamental Stone we took pictures of a wide selection of materials from natural stone and boulders, to manufactured landscaping bricks and landscaping blocks. We then put it all together for you so you can see what is available and how these materials are bought, sold and shipped. Then you can decide on what you want and learn how to estimate how much you will need. A quick note on safety in and around the yards. Loader working in a landscaping yard. Visiting a landscape supply yard is not like a visit to your local garden center. The first thing to keep in mind is safety. When you drive in the yard, find the designated customer parking area, so you aren't in the way of loaders or other moving equipment, they will appreciate this. Oh…and please don't block driveways. When out of your vehicle keep your eyes and ears open for moving equipment. Most equipment now has standard backup beepers and other warning signals to let you know when they are moving. Always keep children close by, so they do not stray into any unsafe areas. There are many hazards in a landscaping yard, which can easily hurt you if you aren't careful. 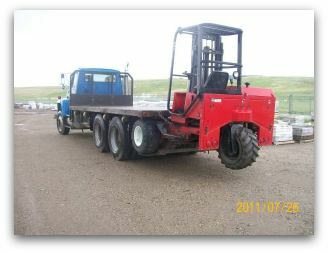 Flatbed and forklift for delivering landscaping materials. Have you ever ordered something that was supposed to be there at a particular time but didn't arrive until much later? I am sure we have all gone through this at one time or another. Driving trucks in residential areas can be challenging and this makes communication important when you are arranging deliveries. Most landscaping suppliers have a customer service representative that sets up deliveries. Be clear with the directions so your materials or products are delivered exactly where they have to go. Also, make sure that the truck can get to where it has to safely. Here is a simple checklist for you to follow when considering having products delivered. Considering these things will save time, money, and headaches for everyone involved in the process. Can the size of the vehicle get to the location, move around, unload, and leave safely? Can the location support the weight of the vehicle and the load safely? 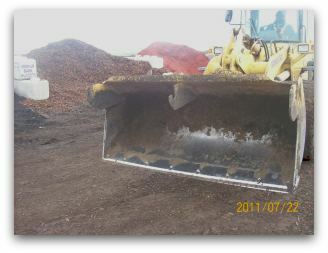 The weight can damage or groove grass and other surfaces. Are there any dangers with overhead power lines or buried utilities? Be there when they arrive so they can drop the load where it is supposed to go. You can also help to keep children safely out of the way. If you can't be there, mark the area with a tarp or an "X" so the driver knows where to deliver the materials. These are little things that can make a big difference when you are aware of them. Pointing out any of these issues in advance help drivers and companies maintain there busy schedules, and complete their job safely. The best time to visit a landscaping supply yard. If you are just at the browsing stage, a trip to the landscape yard is always recommended on days with unfavourable weather. Call first if it is really bad, to ensure they haven't closed. This makes it easier for the customer service representatives to spend more one-on-one time with you. They will be able to answer your questions about their products after you have checked out their selection. Nice sunny days are a little tougher for staff to get away from the sales counter. 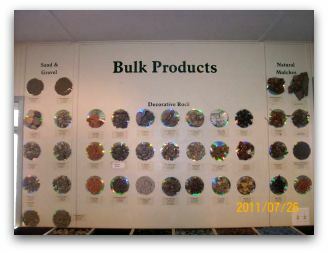 Display wall of decorative rock and gravel products. 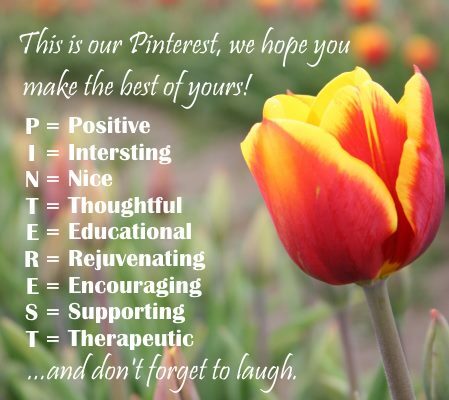 The last thing to discuss before we get into the products, is product names. This is so you don't get frustrated looking for a product that you may have seen in a book, or on an internet site like this one. Rocks and other natural products can have different names depending on the yard you are in. Quarries can be thousands of miles apart selling almost identical products, but they usually give it their own brand name. It could be named after the quarry, river, mountain, state, or region it came from. Landscaping in Calgary is a little different than landscaping in Atlanta, Manilla, Berlin, or Christchurch. Bring pictures with you when possible, to match the color and geological composition rather than a name. Your local yard will probably have what you are looking for, or can get it for you, but may call it something different. 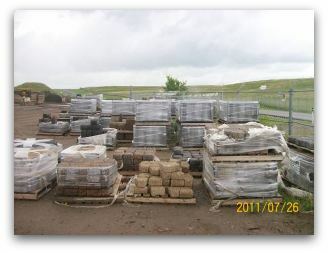 Soil suppliers and landscape supply yards can also brand name their soils and garden mixes. So let's get started with manufactured products and look at landscape blocks and landscaping bricks.